Readers, August has completely disappeared… as witnessed by my lack of posting. I’d love to say it’s because I’ve been on holiday. It’s not. Although, I am going to Thailand in September, so not all is bad with the world! It’s a long overdue break. With an upcoming wedding and a million things on the go at work, I very much look forward to chillin out for a week. But back to the present and the latest exploits from my Glasgow food blog. Last Thursday, Mr WhatClaireDid and I were invited along to The Dhabba. They’ve recently updated around a quarter of their menu and as I learned last week, have been a Merchant City institution for 15 years now. There was a real mix of guests - most slightly older than us – groups of workmates and a big party arrived as we were leaving. I’d say The Dhabba is one of those places that people keep coming back to. I love being a Glasgow food blogger, because it lets me try so many so many great local food places. 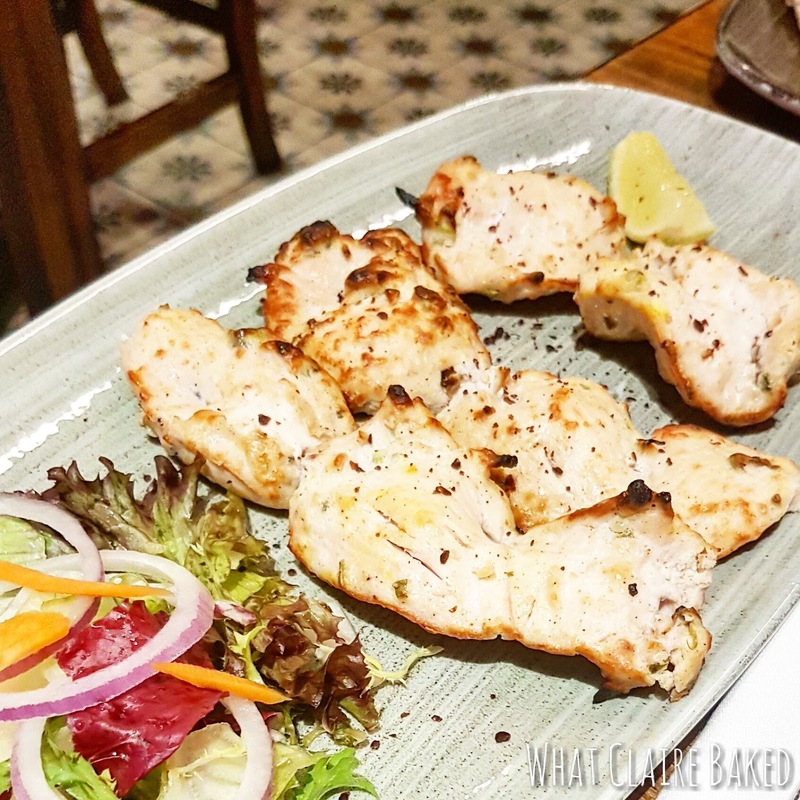 The Dhabba specialises in north Indian cuisine – if you’ve ever been fortunate enough to visit India, you’ll know that roadside diners over there are known as dhabbas. The food was amazing. It was beautifully presented – with care and attention. The waiting staff were also good fun, having a bit of a laugh as we didn’t know the chaat pakodi was meant to be eaten with our hands. 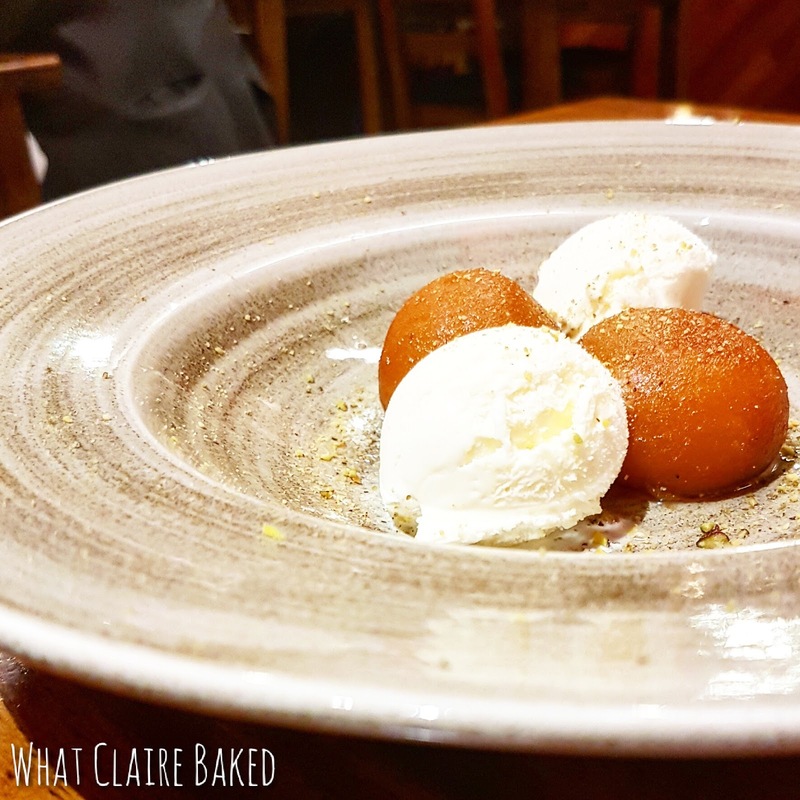 I also had never had gulab jamun (why oh why, I don’t know… it was delicious) but more about that later! Our waiter brought us some mini poppadums and chutney to enjoy as a snack, whilst we waited on drinks and starters. Just enough to leave us happy, but not too full! 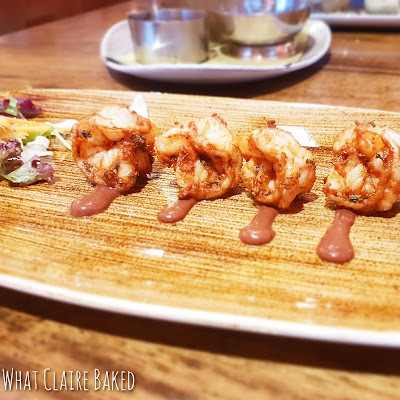 I kicked off my meal with koliwada jheenga – king prawns with a spicy savoury glaze which were ever so slightly crispy. They were brilliant – clearly a popular item on the menu as I saw a number of other diners getting stuck in. 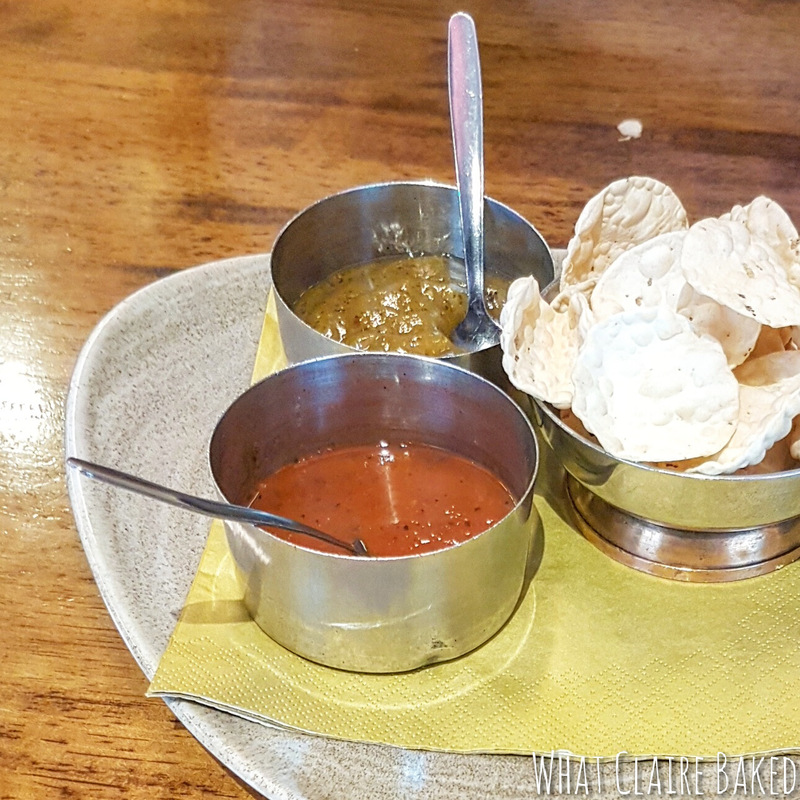 Mr WhatClaireDid went for gol gappa chaat – bite sized crispy puffed bread, spiced potato and chickpeas which afterwards we learned were designed to be picked up and eaten in one mouthful. The culture lesson was appreciated – we’ll know for next time! 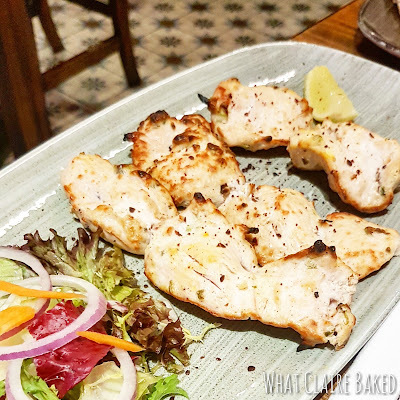 I went for a dish from the tandoor oven for my main – the smokey flavour from the chicken was incredible. I thoroughly enjoyed my malai murg and went for a rich mild sauce with my chicken. The portion size was just right – as was the ratio of chicken to sauce. Mr WhatClaireDid went slightly more daring with a lamb bhuna – perhaps India’s most famous lamb dish. We shared sides and this was more than enough – a portion of cumin basmati and a traditional plain naan, to scoop up any leftover sauce. Usually, after an Indian, I’ve no room for dessert, but honestly, the gulub jamun was worth keeping space for. It’s a traditional Indian dessert, although I’d never tried it before. Little reduced milk dumplings are soaked in sugar syrup and served warm with vanilla ice cream. The mix of hot and cold was great and it was a bit like a tiny donut in texture. After saying he didn’t want anything, Mr WhatClaireDid definitely sneaked AT LEAST HALF OF MINE. The Dhabba’s latest menu update is only the third time since 2002 that it’s made changes to the menu. It’s testament to a loyal customer base that enjoys its timeless classics and traditional menu that doesn’t date. You’ll find out more by paying a visit yourself to the venue in Candleriggs, Merchant City, Glasgow. 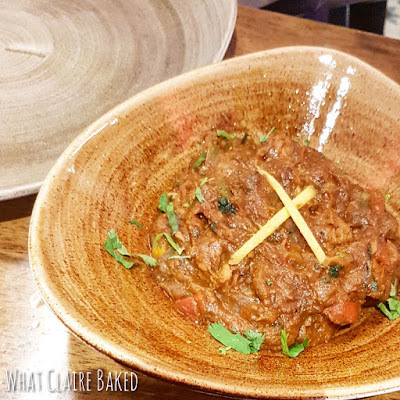 Disclaimer: I was invited along to The Dhabba to try the revised menu. Any opnions expressed are my own.